Los Angeles Mayor Eric Garcetti will be the keynote speaker for the 2019 baccalaureate ceremony for USC degree candidates and families, USC announced. The ceremony will take place at 5 p.m. May 9 at Bovard Auditorium, followed by the baccalaureate dinner at 6:30 p.m. on Pardee Way. Garcetti, a fourth-generation Angeleno, was elected as the 42nd mayor of L.A. in 2013. He is the city’s first Jewish mayor and the youngest elected mayor in history. Before his election to the Los Angeles City Council in 2001, Garcetti was a visiting instructor of international relations at USC and formerly served on the California board of the Human Rights Watch. 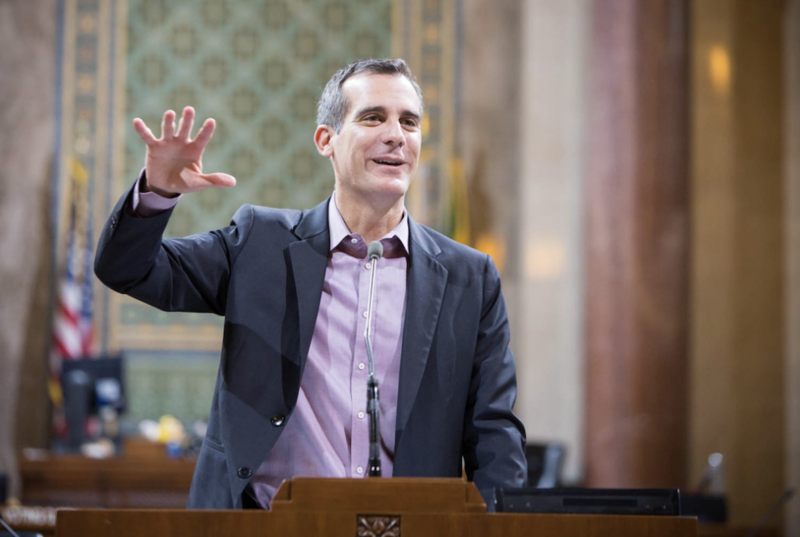 Garcetti recently spoke at the Climate Forward: Navigating the Politics of Climate Change conference on April 4. The conference brought together leaders from across the world at USC to discuss climate policy and international cooperation, including former British Prime Minister Gordon Brown and former Secretary of State John Kerry, climate change and policy solutions. In December, Garcetti’s speech at an event commemorating the 70th anniversary of the Universal Declaration of Human Rights at Bovard was interrupted by demonstrators who criticized the mayor’s policies on homelessness and policing. The protest was organized by groups like Democratic Socialists of America and the L.A. Community Action Network. “We all look forward to hearing his words of inspiration and guidance, as we send our newest class of Trojans off to make their way in the world,” Austin wrote. According to USC News, over 18,700 degrees will be awarded this academic year during the commencement ceremony. The main ceremony will take place in Alumni Park and the various satellite locations across the University Park and Health Sciences campuses. U.S. Representative and Vice-Chair of the Black Congressional Caucus Karen Bass will deliver the keynote speech at commencement. The post Garcetti named as keynote speaker appeared first on Daily Trojan.